For all USA orders over $50; Canada over $75; International over $350. 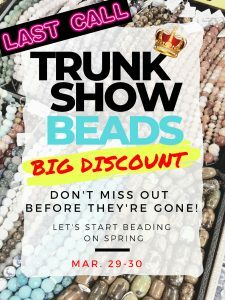 Last Call Trunk Show Beads – Big Discount (Mar 29-30th). Check them in store before they’re gone on next week. We're one-stop beaded jewelry gift shop of N. Dallas Suburbs in Collin County; conveniently located in North Dallas Suburbs of Allen and Plano, Texas; Our Allen/Plano showroom offer wide selections of beads and finished jewelry include semiprecious stones, seed beads, silver & freshwater pearls, plus jewelry making classes and tools.